In this episode, Heather speaks with Judith Scimone, Director of Talent Management at Google. This is a rich conversation focused on Judith’s foundational beliefs about the roles of a leader, her brilliance in connecting with her global team, and her light bulb moment when she was not the best leader she could be. In order to really understand what someone is good at, you must care. Leadership is ensuring everyone can bring their best selves to work. Don’t wait to receive a mission. Rather, bring your own personal mission to any work you do. Leaders find a way to get their people closer to their own missions. Is it better to risk a disconnection with the organization, or just be vulnerable enough not to be perfect? Her focus on people and the energy she puts behind her role and talent is truly above and beyond. Don’t miss this one! 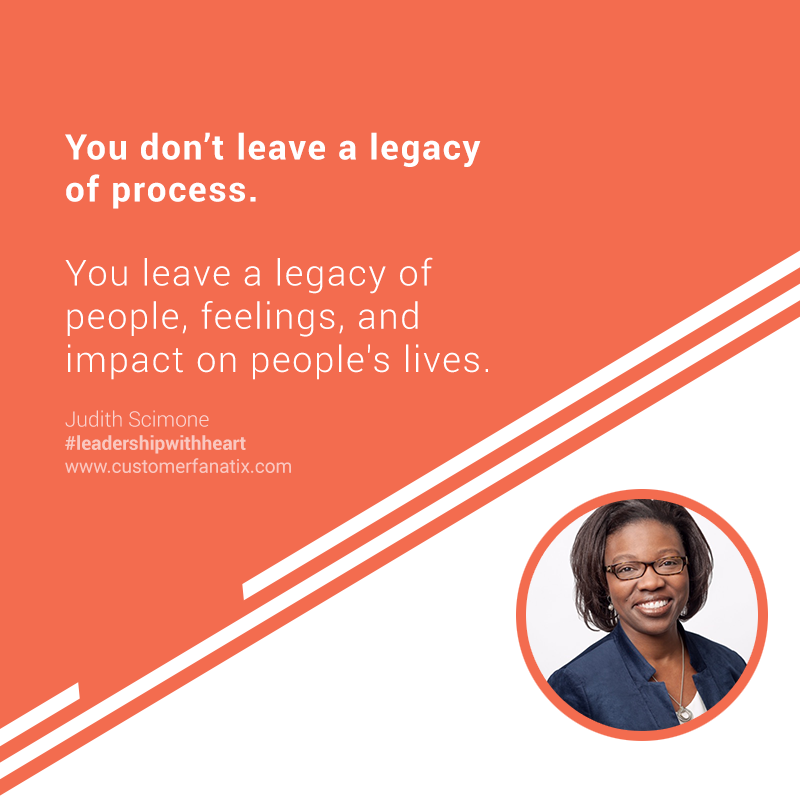 A season HR professional, Judith Scimone is the Director of Talent Management at Google. Prior to joining Google, she has held talent management, HR business partnerships, diversity and inclusion, and consulting roles at Johnson & Johnson, Motorola, Bank of America, JP Morgan Chase, and Hewitt Associates. She began her career as a Mechanical Engineer at General Electric. Her experience spans multiple industries, geographies and functional areas. Judith has lived across America and the Asia Pacific. She holds a degree in Mechanical Engineering with a minor in Mathematics from Carnegie Mellon University and an M.B.A. from Yale University. It’s really all about caring. I care. I care enough to develop them to be their best. I care enough to learn what matters to them. I care enough to tell them when they are off track. I care enough to get out of the way and enable them beyond my vision of them, and for them. I care enough to be real. Having relationships with your people helps you know and understand where someone’s good at. You have to care enough. You have to know what they need to improve. It gives you such access to a person, which puts them into context of partnering together to make them better, or be the best they can be. When you go, that’s what you’ll think about. It’s the legacy that you want to leave. It’s a great feeling when you know you can get people aligned on a mission. They are excited, moving, executing, and doing really well. When you can do that, it’s just so rewarding. You take nothing but your authentic self, your experience and your care for them to that place, and it just works. I have just been blessed in my life with so many experiences– work in many industries, in different countries, and it’s awesome to join a company with a mission that really resonates with me. There’s not a lot that I can’t do, as long as I believe in a mission. In the mission that I am on, I can do it anywhere. It’s about people, and I have been fortunate that that’s my life’s work, because it’s transferable. It’s transferable anywhere I go. It’s transferable even in any conversation I have that is outside of the workplace. In my social life, I’m just all about really tapping into someone’s uniqueness, and thinking how to optimize that to make that person happy. By the way, it will always drive results for your employers. So, why not do both? Even the people in my team talk about, “How do your aspirations match what you’re doing and where you’re focused?” I think there’s always a fear of bringing your true authentic mission into the workplace. There’s a feel that if you bring it there, it might not be aligned, and you have to rethink it. Your mission might not be completely misaligned with what you’re doing. There are ways to better align your mission with your doing. If your mission is more than a job or an action, it’s a calling. How do you fulfill that calling no matter where you’re sitting? I definitely encourage just being real about your mission, because your mission has a place anywhere. I found that to be true for myself. Talent Management really focuses primarily on the leadership pipeline for the future. It’s really working with executives, and senior rising talents as well. Our focus is ensuring that we have the right power pipeline throughout the organization. But we really focus our efforts first on those people who are going to rise into the leadership ranks. What we miss out on sometimes, as leaders, is the opportunity to help them find what they need with us, too. That happens more often than not. If you’re afraid to bring your full self to work, you’re going to find some place which will accept the self that you cannot bring to your current workplace. So, why not uncover what that is here, and see what we can do? And if we can’t, be honest enough and think about it. But, generally, there are some ways to make the work that you’re doing now feel different. Part of my responsibility has to do with helping people to be their best selves.